New England’s Largest Local and Regional Government Collective Procurement Service. help of professionals from the buyer community. Then, MAPC designs and conducts the procurement process best suited to the goals of each program, awards contracts, provides all necessary documentation, establishes buyer access to vendors and, unlike any other collective purchasing group, advocates for buyers when the need arises. 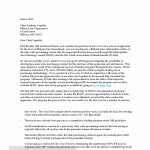 Convenience, simplicity, price, fast results and of course, the quality of our vendors, distinguish the MAPC Collective Procurement Programs from all others. MAPC performs collective procurement’s of office supplies and highway maintenance services for groups of municipalities having the common goal of saving administrative time and money while buying what they use on a daily and seasonal basis at highly competitive prices. From paper to paving to catch basing cleaning, consortium contracts have been a staple of the MAPC program since 2000. After years of dealing with the bureaucracy involved in publishing specs, advertising, bid openings, bid post mortems, followed eventually by a bid award to a vendor, the state contract has really taken a lot of pain away for both the customer and vendor alike. Ease of use. The City/Town simply selects which truck they want, you build the truck by selecting a base truck plus desired options, and you issue a PO. It is that simple. 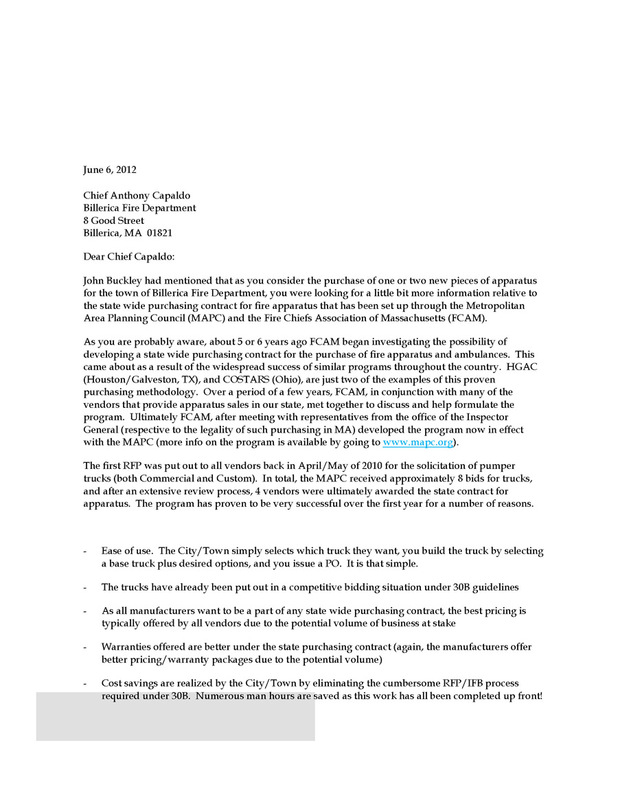 Cost savings are realized by the City/Town by eliminating the cumbersome RFP/IFB process required under 30B. Numerous man hours are saved as this work has all been completed up front! These are just a few of the many reasons to utilize the MAPC/FCAM state wide contract for apparatus. 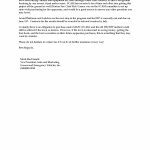 Greenwood has been awarded the contract for pumpers through December 31, 2012, and for Aerial Platforms and Ladders until December 31, 2013! Ambulances are on the agenda for this year and should be ready to go by the Summer of 2012! And Billerica, MA as the first two time user of MAPC and first to utilize the new Aerial Contract with their purchase of a new 100’ aerial! Thank you to all of you that have taken advantage of the program this year! We look forward to the continued success of the program. “SHOP AND BUY” . . . It’s New and Easy. 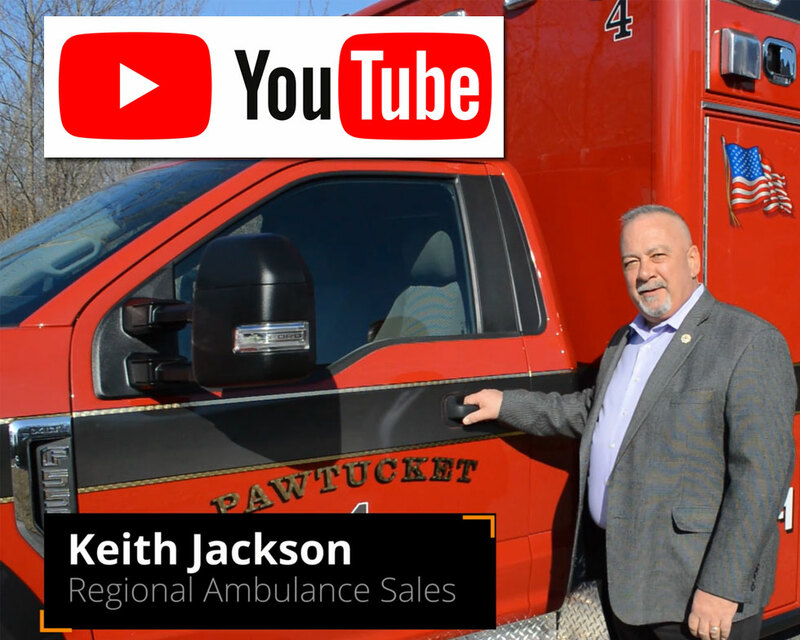 This program — the first of its kind in Massachusetts — is FCAM’s answer to a question that has been asked by local officials for decades: “Why can’t fire apparatus be standardized to simplify the purchasing process and lower the cost?” This program does that and more. By procuring contracts with multiple vendors that are available to the more than 320 member municipalities of FCAM, the potential for sales attracted several high quality manufacturers who sharpened their pencils in offering an array of non-custom features at very competitive prices. Contracts for ambulances, rescues and specialty equipment are due in 2012. IS MY CITY OR TOWN ELIGIBLE? YES…In FY2011, the first year of the program, 10 departments bought 12 engines. The program’s pricing, the choices offered, the significantly shortened delivery time and the simplicity of making such important purchases has stimulated sales. Through December 2011, another 12 engines and 1 aerial were purchased. IS THERE A COST TO BUY THROUGH THE PROGRAM? YES…There is the price of membership, which comes with the full member benefits of FCAM. And, there is a fee based on the price of the apparatus you buy that pays for the services provided by MAPC. A portion of the fee helps FCAM fund programs that benefit its members. HOW DO WE ACCESS THIS PURCHASING OPPORTUNITY? 1. Go to FCAM.mapc.org to view all available apparatus, features, options, specifications, photos, contracts and pricing. 2. Get a sense of what features, quality levels and pricing suit your needs and budget. 3. Contact a vendor for a quote. 4. 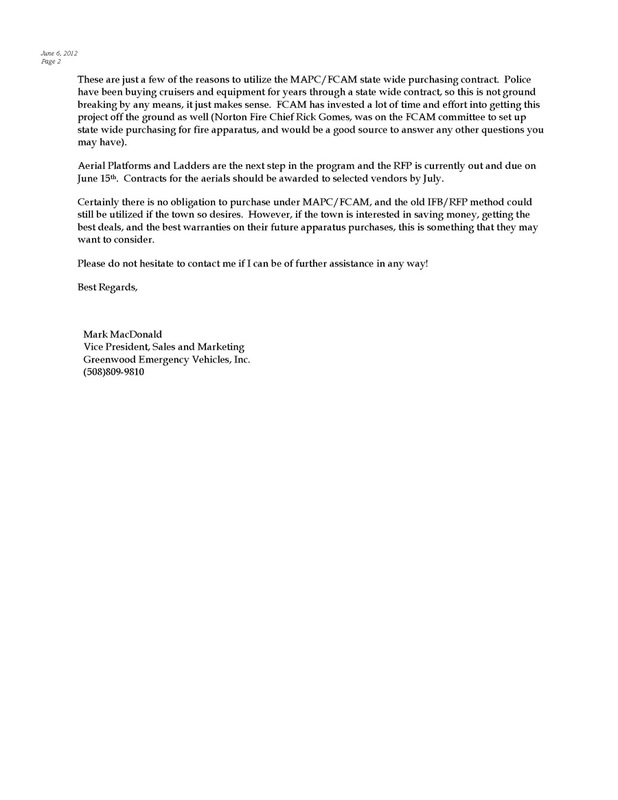 Send the quotes to MAPC for price verification. 5. Issue a purchase order. HANOVER, MA TAKES DELIVERY OF GREENWOOD’S FIRST “STATE CONTRACT” PUMPER! 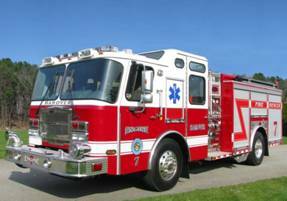 Hanover, MA recently took delivery of their new Engine 7, an E-One Typhoon Custom Rescue Pumper. 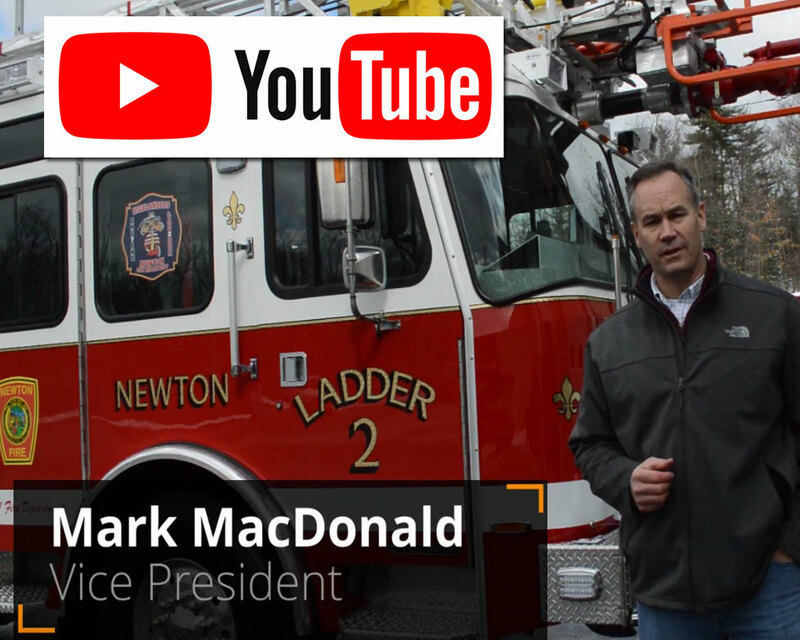 In addition to boasting a Hale QMax 1500 gpm pump, a 750 gallon poly tank, 30 gallons of foam, and an Akron 125gpm foam educator system, this truck is a “first of its kind” because it was the first truck delivered by Greenwood under the new Metropolitan Area Planning Commission (MAPC)/Fire Chiefs Association of Massachusetts (FCAM) state wide purchasing contract for fire apparatus! 1. 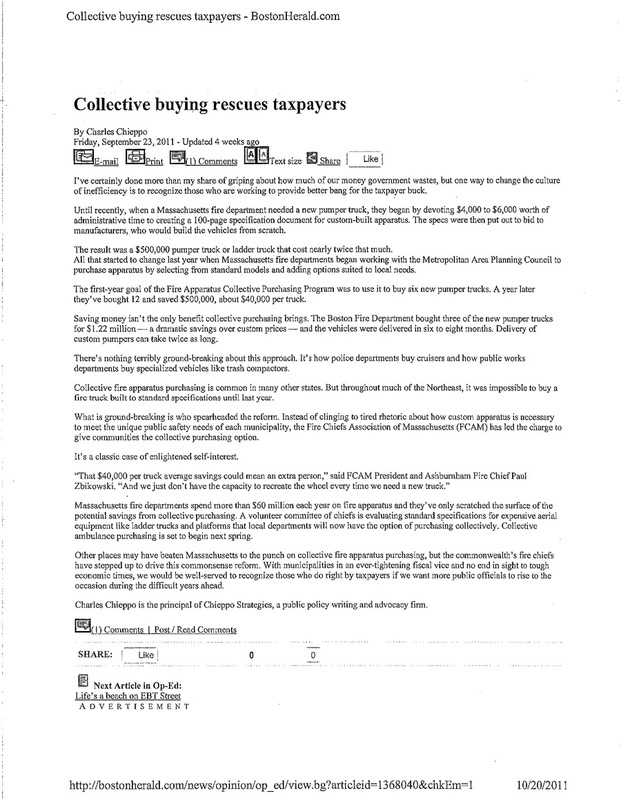 Collective buying rescues taxpayers Article.